There was a time when personalized T shirts only seemed to appear in sports contexts, but those days are long gone. Today, cheap custom T shirt printing is widely available, making it a favorite option for teams and organizations of all kinds. Here are our five favorite uses for personalized T shirts. Before stepping out to walk or run in memory or honor of a loved one, many race participants make a call to their custom T shirt printer to order team shirts that show their reason for running. By wearing the face or favorite quotation from your inspiration for donating, you can not only motivate yourself, but show your love and appreciation to spectators and other racers. Billboards are expensive, and commercials aren’t cheap either. Custom made personalized Tshirts, however, have a much higher ROI, especially when they’re worn not only by your team, but by happy customers. Put your logo and information on T shirts for wearable advertising that makes an appearance all over town! In case that family resemblance isn’t enough to let strangers know you’re a unit, custom T shirts can be perfect for getting the message across. Whether it’s for safety on a family trip to a crowded amusement park or for a little reunion solidarity, custom shirts are a great way to let people know that you come as a package. Being a high school senior is an experience in and of itself, and there’s no better way to show class pride than to order custom shirts. They don’t just make great fundraising pieces, but they let students wear their school spirit proudly! 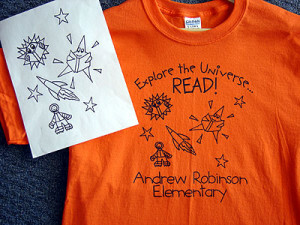 Personalized T shirts have plenty of great uses, and we’re sure there are even more we haven’t thought of. Where else have you seen custom shirts? Spotlight Apparel, Inc. is a locally owned and operated company creating custom made T-shirts for over 35 years, in Jacksonville, Florida. We are dedicated to creating a unique look for any event. Posted in Event Planning, Promotional Products, Screen Printing and tagged personalized screen printing, personalized t shirts.